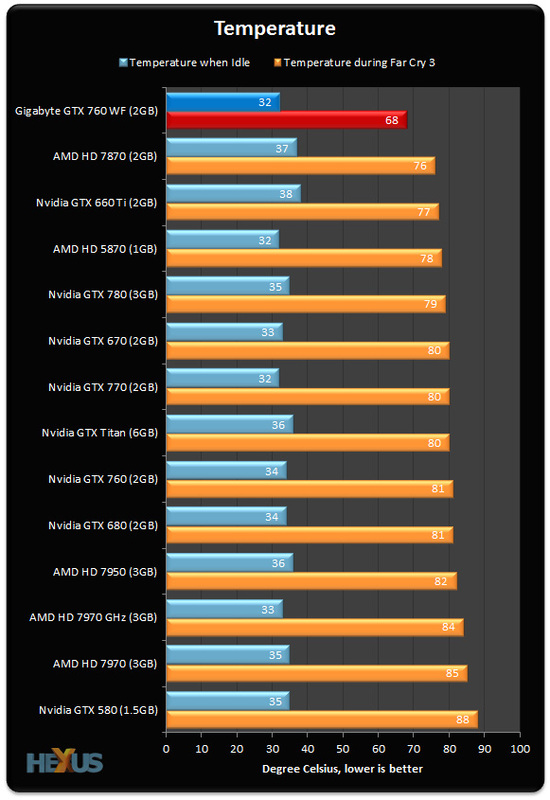 Factory-overclocked GeForce GTX 700-series cards continue to show little concern for power efficiency. Partner cards such as the GTX 760 WindForce 3X carry a greatly relaxed voltage curve to help make the most of the GPU Boost 2.0. The end result is bags of performance, coupled with slightly higher electricity bills. Our review sample's direct-touch heatpipes must be making particularly good contact. Whatever the reason, the WindForce 3X cooler is doing a fantastic job. 68°C when gaming is practically cold for a mid-to-high-end card. That's nice to see, too. We found that earlier iterations of this WindForce 3X design were unnecessarily aggressive - the three fans in last year's GTX 680 variant would ramp up to 75 per cent (almost 4,000rpm) - but there are no such problems here. 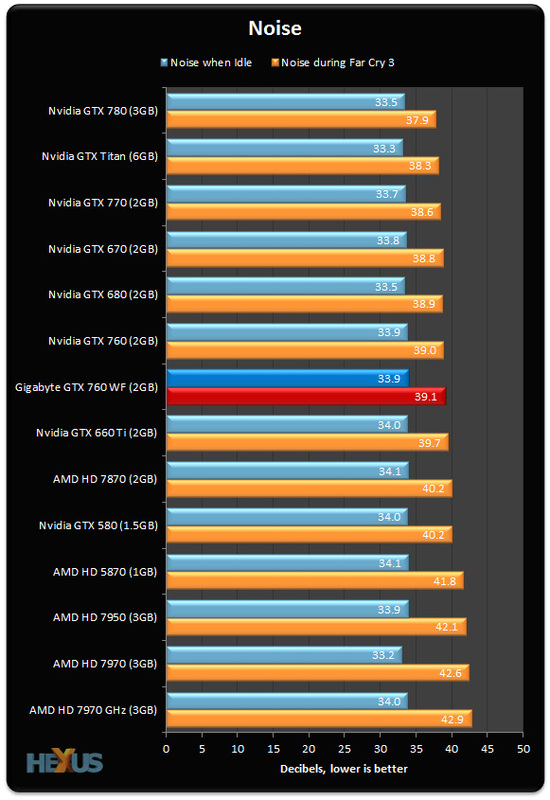 Gigabyte has tuned the fan profile on the GTX 760 model to achieve a better balance between noise and performance. 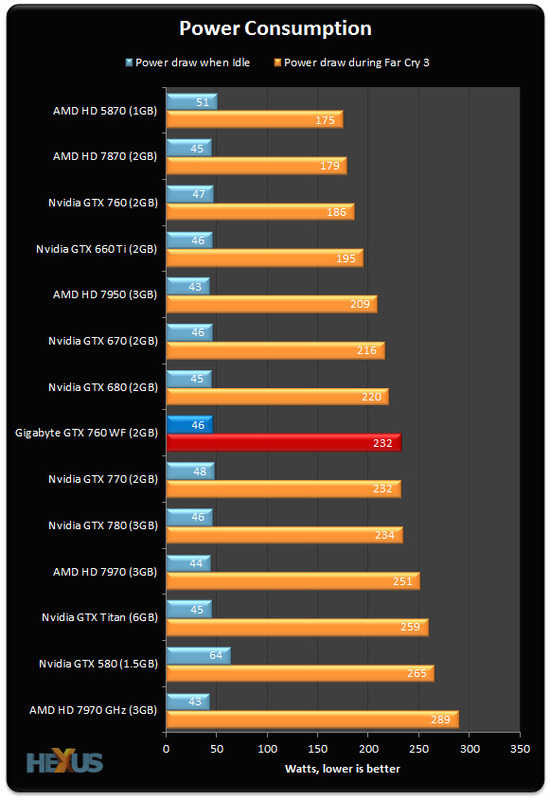 The card runs cool and the fans didn't exceed 55 per cent (around 2,500rpm) throughout our entire benchmark run.